As the title implies, Carter's latest (The Puzzle King, 2009, etc.) 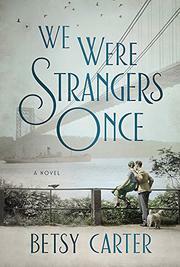 explores the experiences of a group of Jewish refugees from Germany in 1930s New York City while also offering a nod to earlier Irish immigrants. Carter takes her time establishing protagonist Egon Schneider’s family history and credentials. In 1890, illustrator Elisabeth Arnstein and naturalist Rudolph Schneider, both secular Jews, fall in love, marry, and raise only child Egon. By 1900, the publication of their opus European Ornithology has earned the couple a reputation as “the Audubons of Europe.” After Elisabeth’s death, her sensitive spirit broken by the poverty she witnesses in post–WWI Germany, Egon decides to become a doctor. His college roommate, Meyer Leavitt, an aspiring writer, recognizes the Nazi threat before Egon does, but by the late 1930s both men, along with a number of acquaintances—this story is about survivors, not the victims left behind—have arrived in Manhattan. Meanwhile Carter shifts gears to trace the family history of Catrina Harty, the daughter of Irish immigrants. By her late 20s, Catrina has survived her father’s desertion when she was a child and the deaths of not one but two husbands, one barely explained, the other under suspicious circumstances. The romance of Egon and Catrina, who meet at the grocery deli counter where Egon works since his medical license is useless in America, must weather any number of obstacles, but their interminable goodness and kindness make for rather dull characters. More intriguing are some members of Egon’s circle: a bitter, formerly wealthy banker’s daughter; a couple who are too homesick for Germany to adjust to their new world; and secretly sensitive pessimist Meyer, who writes about his friends with brutal love. The journalistic flatness of the narrative and Carter’s tendency toward easy sentimentality make for a disappointingly pedestrian take on what should be a dramatically charged subject given today’s refugee crisis.